Panoramic live wallpapers for the iPhone? If the first beta version of iOS 7 is indicative of the imminent public release of Apple's revamped mobile operating system, the answer is a resounding yes. UPDATE: The final build of iOS 7 does not have this feature anymore. Hopefully, they'll add panoramic live wallpapers in an update soon. 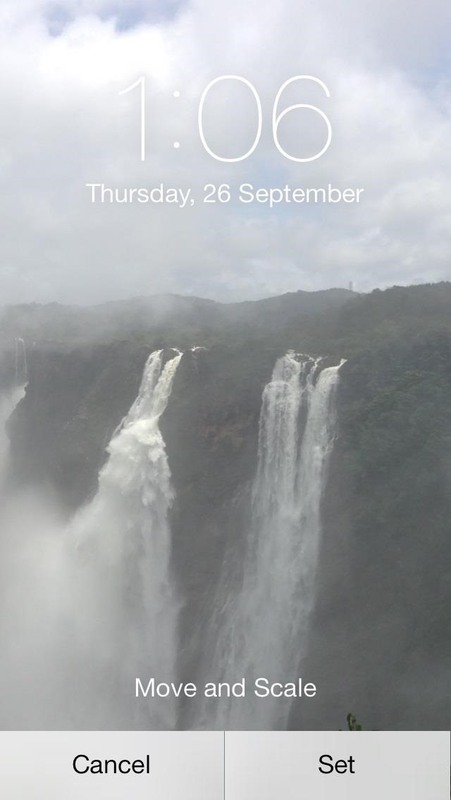 In the new iOS 7, you can capture a panoramic photo using the Camera app (just like you would in iOS 6), then set it as the wallpaper for your home or lock screen like you can on some Android devices. To set a panoramic image as your live wallpaper, you'll need to first capture a panorama, if that wasn't obvious. Preferably of something pretty, like nature or something. Once you have your panorama, go to Settings -> Brightness & Wallpaper and tap on Choose Wallpaper. Next, tap on Panoramas and choose the image you want to set as your live wallpaper. Don't do it from the Camera Roll—it won't work—even if the image is a panorama. And that's it. Before you set the panorama live wallpaper, you can preview it to make sure it's to your liking. After you press Set, you'll have a live panoramic wallpaper as your background on your iPhone. The image will pan around from side to side in the background whenever you switch between screens. You can now get the most out of those 240-degree shots! To see how it looks in action, check out the video at the top of this article. can you use a previous panoramic image that's saved in your photos as a panoramic background? In previous versions of the iOS 7 beta, panorama was available on the iPhone 4S, iPhone 5, and 5th gen iPod touch. But, the new iOS 7 has removed the panorama feature for some reason. Hopefully it'll come back in the next update. Does anyone know how to set normal pictures for your lock screen. I know how to do it generally but with the new ios 7 it always zooms in on pictures and when trying to reduce them it wont let me, is this anything to do with the live wallpaper/panoramic? if it is then its a massive down fall for me because i like having personal pictures on my lock screen and whatever else on my home screen. Tina, Jason... the zooming is because of the parallax effect. To disable it, simply head over to Settings -> General -> Accessibility -> Reduce Motion and make sure it's turned ON (green). This will allow you to set custom wallpapers without them automatically zooming in on you. For more help on custom wallpaper issues, check out our complete guide to iOS 7 wallpapers for tips and tricks. I didn't know what the panoramic folder was so i deleted it : Do i have to reset my phone to get it back? No, the next time you take a panoramic image, the folder should come back in your Albums. Its not working on my iphone 5 i have tried the same options as above. when i goto the panoramas and select the panorama image it has only option to move and scale.help me out if any other settings to be corrected before. Yeah, not working right now. This was from an earlier beta. Might not every come back! Earlier i use to be able to parallax the panorama photo on my home screen but can't anymore, but its not a bad feature to have and we are planning to put in our new app for panohrama.com.